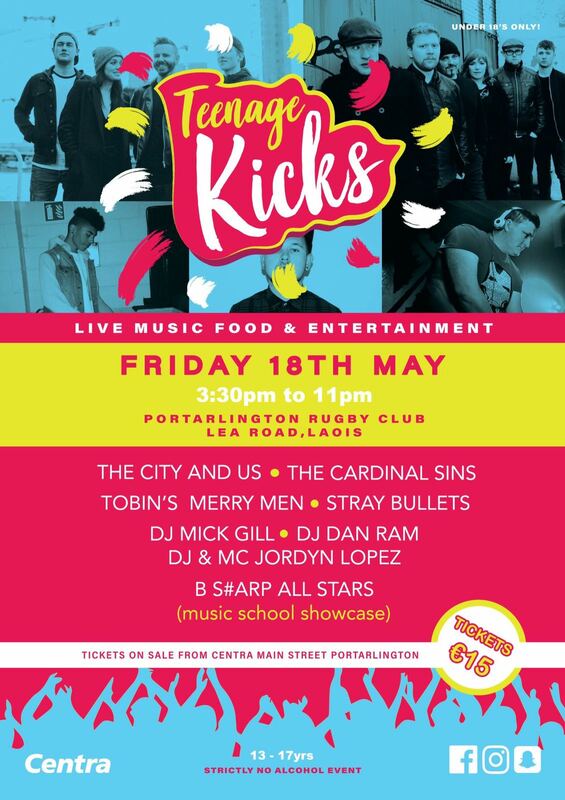 WIN: Grab yourself a pair of tickets to Portarlington's Teenage KICKS! The organisers of Teenage KICKS in Portarlington have teamed up with the Leinster Express and Offaly Express to give one lucky winner a free pair of tickets to this year's event. Teenage KICKS, offering music, food and entertainment, returns to Portarlington RFC for a third year after the overwhemling success enjoyed in 2016 and 2017. Teenage KICKS is aimed at under 18 teenagers and promises to be a day of fun and madness. Doors open to the party at 3:30pm, giving loads of time to get out of the school uniform and get glammed up! The day begins with the ‘B S#arp All Stars’, showcasing musicians from the local music school. The days lineup then includes bands like ‘Tobins Merry Men’ and ‘Stray Bullets’ with various DJs interspersed such as DJ Dan Ram, DJ Mick Gill and DJ, and MC for the day, Jordyn Lopez!! Finishing the day are the rip roaring ‘Cardinal Sins’ followed by the night-ending headline act ‘The City and Us’, a brand new Irish alternative band. Based in Dublin, this exciting new 4 piece have been exciting audiences with unique blend of acoustic tracks with a hint of electro. The new group have been making waves in Ireland and beyond with most of their future touring coming up in UK, Germany, USA and all over Asia. Entertainment on site includes various amusements from McCormack’s carnival while there will be food and soft drinks available on site. This event is strictly nonalcoholic and fully supervised by PSA licensed security. To win a pair of tickets to the exciting event, simply head over to the Leinster Express or Offaly Express Facebook pages for all the details on how to enter. Tickets for the event are priced at €15, with some early bird €10 tickets still available from Centra on Main Street in Portarlington, and from Brew Café, Dublin Rd, Portlaoise. For more information, check out 'Teenage Kicks Club Experience Portarlington' on Facebook. This year, Portarlington RFC are also hosting an adult version of the festival experience with live music and dance. We also have tickets to give away to that spectacular event, boasting tribute acts Daft Funk and the Knights of Leon. Use the link below to find out more about entering that competition. SEE ALSO: Your chance to win a pair of tickets to Portarlington's KICK 2018!